You have insomnia. You're tossing and turning but you've run out of Rozerem. Your dreams miss you. What do you do? 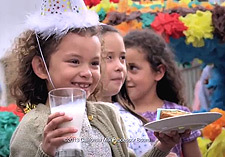 Well, in its latest Hispanic-focused campaign, the California Milk Processor Board suggests tryptophan. Not literally, of course, since there may not be a word for that in Spanish. But there is for milk, and for its latest Toma Leche ("drink milk") campaign, the board is using really cool dreams to extol the benefits of milk-fueled sleep. The second ad is a war scene set to “I Love You” by the Zombies: a submarine opens fire on a beach, shooting a barrage of rubber duckies to the joy of a bunch of little kids. The counterattack: a shower of cupcakes and clown paratroopers. Cut to a boy sleeping with his teddy bear. Steve James, executive director of the California Milk Processor Board, tells Marketing Daily that the effort "is a continuation of our positivity campaign, in this case that having a great outlook on life includes getting a good night's sleep." James says that milk's own skirmish is about grabbing consideration from such functional drinks as fortified water and salubrious sodas that pack retail coolers. "It's still an uphill battle to get people to remember milk," he says. "But we do tracking studies three times a year to look at consumption, and those show that there has been a positive movement." The media buy includes cable and spot TV, radio, and Facebook and YouTube-centric social media programs.